Tom Brokaw’s Journey With Multiple Myeloma: Are Celiac Disease And Multiple Myeloma Linked? As I have researched since 2004 I have found such cancer-related terminology as lymphoma, lymphatic, leukemia, leukemic, myeloproliferative, malignant, and more linked to gluten and celiac disease. Many blood and bone disorders are linked to gluten, and some of the cancers associated with celiac disease are throat/esophageal, stomach/ intestinal/colon, and many more. I couldn’t believe the information on autoimmune hepatic liver and sclerosing cholangitis. These two diseases can resolve with a gluten-free lifestyle. My father died of liver cancer and it was thought by his doctor, much later after reading the stunning research, that he had these two disorders before they turned cancerous. If you have cancer or know someone who does (doesn’t everyone?) it might be important to determine if they are gluten intolerant or have celiac disease. There is a catch 22, however! The test results for celiac disease (CD) might be affected by chemo and other heavy-duty drugs so the results might not be a true reading: if you tested negative you might really be positive. You need to request a panel of blood tests (the typical one may not be enough to detect intolerance), and if negative on the blood tests do your body a favor and do the specialized stool testing (Chapters 16 & 17). If you have undetected celiac disease or gluten intolerance or don’t address a gluten issue with an absolute gluten-free lifestyle your body can become quite compromised over time. CD can affect any part of the body and can hugely affect your immune system. How can your immune system even begin to fight any cancer cells if it is drastically compromised? And where do those cancer cells come from anyway? Might it have something to do with all the inflammation from celiac disease or antibody reactivity? I strongly expect so! If you have most any chronic health issue lingering for 2-3 months it would be important to detect whether or not you are gluten sensitive. 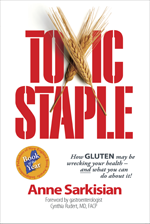 Over 300 symptoms and maladies are linked to gluten….that doesn’t leave much to your imagination! Some of the latest webinars** and presenting forward-thinking doctors are saying if you have a healthy gut you’ll never develop cancer or autoimmune diseases. You don’t have a healthy gut if you have undetected or unaddressed CD. Many folks are diagnosed with a miserable, life-altering cancer without manifesting any symptoms. “But I’ve been healthy my whole life,” they say. Don’t wait for this most serious diagnosis to hit your family. Especially if you do have health issues. It could be time to look your symptoms and diseases/maladies square in the face. You may be able to turn your health around before something really traumatic consumes your life. I’ve tried hard to reach out to some folks who have gone through cancer treatment or who have other serious life-threatening diseases, but most of them go to the best doctors (who never mention celiac or gluten) and they expect their doctors would know this vital information. But there is little being done to present conferences to educate all our doctors in all facets of medicine. It’s like banging your head against the wall. It will need to become a grassroots movement much deeper than the faddish movement folks are trying now. And it will take decades for all doctors to begin to understand the full implications of what gluten is doing to much of the human race, but the research is there. Kindly share http://www.toxicstaple.com and this blog with your ailing family and friends.